English in origin, the primary function of the cottage garden was for growing vegetables, fruit and herbs for the home. Most herbs were used for medicinal purposes while the vegetables and fruit were a food source. During the late eighteenth and early nineteenth century, however, the use of the cottage garden went from utilitarian to romantic and decorative. Today the cottage garden is full of color and variety with a cheerful disorder that is surprisingly contemporary and appealing to many gardeners. For the most authentic look, locate your garden in a sunny area on either side of the path leading to the front or kitchen door so everything growing in the garden is easily accessible. Cottage gardens are typically enclosed in a hedged, fenced or walled area and may extend right up to and even surround the house. The classic charming English cottage garden will contain a tightly packed, random assortment of perennials, annuals and edible plants with a natural-looking path winding through the middle. Use mulch, stones or pavers for the walkway where a permanent one does not exist, but keep the path narrow to maximize growing space. Another important addition to the cottage garden is a vertical element that enhances and expands growing space. Try a climbing rose on an arbor or fence, a honeysuckle, clematis or annual vine on a trellis or obelisk or a climbing hydrangea on a wall. A vertical element is a very important dimension in the cottage garden that will provide structure. Additional welcomed features to the cottage garden include vibrant hanging baskets hung from shepherds’ crooks and window boxes overflowing with color attached to your windowsills, garage or sat atop of a stone or brick wall. Cocoa-lined hayracks and hanging baskets will give a real Victorian look to your garden. 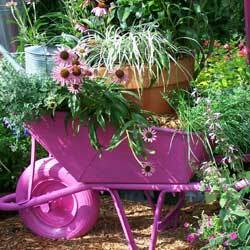 The delightful informality of the cottage garden makes it a perfect place for garden accessories. 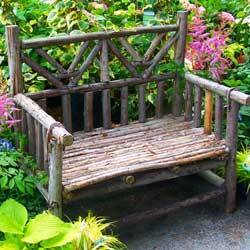 If you have the space, include a bench or small seating area, ideally under an arbor or alongside a trellis. A small fountain, statue, gazing ball or bird bath can also add enjoyable elements to the garden. Opt for a bit of movement with hanging features such as wind chimes or decorative flags, or add a touch of whimsy with a fairy garden aspect, gnomes or toadstools. Around every corner, your cottage garden will have surprises to delight any visitor!